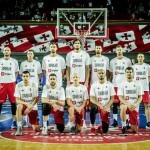 The National team of Serbia won 84 – 61 against Greece in the FIBA Basketball World Cup 2019 European Qualifiers in the “Aleksandar Nikolić” Sports Hall (also known as Pionir), in Belgrade. It was the first defeat for Hellas in these Qualifiers. Before the game, Greece had already Qualified for China due to its 9 Victories. On the other side, if Serbia wants to participate at the FIBA Basketball World Cup 2019, Đorđević’s squad needs to win one of the two remaining games in these Qualifiers: against Estonia or Israel. Those games will be played in February. Stefan Jović was the top scorer with 22 points for Sebia. The Point guard from Munich also had 4 assists and 3 steals but 7 turnovers. Two of his teammates finished the game with 13 points each one of them: Miroslav Raduljica and Vasilije Micić. The EuroLeague MVP of November also had 6 assists and 5 rebounds. The last player with double-digit score for the home squad was Stevan Jelovac with 12 points. In Greece, two players had 12 points each one of them: Lefteris Bochoridis and Christos Saloustros. The Home team opened the match in an excellent manner and after the first five minutes the result was 15 – 5. But, the guests soon got back in the game and in one moment the lead was only of 5 points (19 – 14 for Serbia). Again, the home squad took the control of the match and after the first ten minutes the score was 29 – 14. The Second quarter didn’t changed anything on the court. 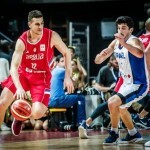 The Serbian squad missed lots of shots from the distance but the offensive rebounds helped them to lead by 17 (40 – 23) after seven minutes of this second quarter. Till the end of this quarter the Greeks got back but Serbia was still controlling the match and after 20 minutes of the game the score was 44 – 35, all thanks to a guests buzzer-beater three pointer. The Third quarter started normally, both teams were scoring till the Serbian squad made some offensive and defensive mistakes. The Guests used their opportunity and made a 0 – 7 series and got totally back in the match. After 25 minutes of the game the score was 49 – 46 for Serbia. Jović woke up his teammates with a three pointer and a two points shot soon after. Then, the defense of Đorđević’s team was the main reason for another double-digit lead (59 – 48 for the home team). Before the last 10 minutes the result was 67 – 48. In the last quarter the home team was just protecting the lead. The Guests were trying to get close, but Serbia didn’t allow any surprises. Everyone in Pionir was applauding at the alley-oop between Micić and Milosavljević three minutes before the end. After those points, it looked like the guests knew they didn’t have any chance so the final score was 84 – 61. It was the maximum lead of Serbia in this game. 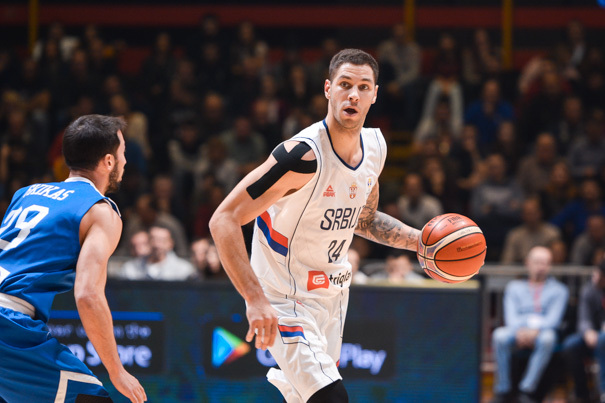 After the 10th round of Basketball World Cup 2019 European Qualifiers, the Serbian Point guard Vasilije Micić was really happy for the fact that Serbia defeated Greece and stayed in the fight for the road to China. “I think this is an important win no matter the difference that was in the end. I think we played an excellent game. Also, other results in the group are helping us, and I hope that I will able to play in the next window”, started Micić his conversation with the journalists. “I am always happy when I play for our national team. The feeling is great and I am always happy like it is a first time. Thanks fans for being with us. We won but their supporting us when it didn’t look so great on the court. Some players had an excellent roles in this win”. The next game, and the first match point for Serbia, is against Estonia, and the playmaker from Efes is hoping to be with the squad in that game. “Estonia isn’t an easy opponent, we need to look at that game as the most important one. I am hoping to be able to help national team during the next window”, said Micić who was the MVP in the EuroLeague during the month of November (as mentioned before). “I am happy to be MVP, it is a reward for my work and I am thankful to my teammates, they help me win this reward. Now, I am going back there and we are expecting Real, but we show everyone that we are playing as a team. That is all due to excellent communication between a coach and the players”, said Micić. Together, Stefan Jović and Miroslav Raduljica made some comments about the victory against the best team in the group. “An important win for us. Next is a game against Estonia, the most important one. We are all turning our heads to that game, so we will be able to play at the World Cup without any drama. 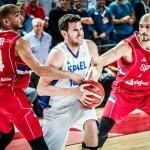 Thanks Georgia for the victory against Israel, but our goal was to win in this match“, said Jović and then Raduljica interfere due to the briefly analysis of his teammate. “Jovke said it very quickly. This was a good game, we won, didn’t we?! We showed ourselves that we can play on the level you all used to. In some moments, we made mistakes but we will correct all that. We all practice for free-four days together, but we won’t use excuses. It is lovely to play in front of this crowd, we are all happy for that”, said Raduljica.